Don’t get me wrong I absolutely adore hosting and having people over, I love it. But for me, I call it my excuse to eat out and treat myself which makes my wallet unhappy. Essentially this just means everyone who comes down, usually from out of town wants to live it up aka bar hopping, drinks, cab rides and of course the highlight of every night out; breakfast! But hey, living in the city food can get expensive especially on top of a night out. Too much Monneeeyyyyyyy hunny. Now I’ve always been super money conscious aka I’m cheap as hell so I’m always looking in how to save money and since its me, obviously I’m going to share a fun creative way to save money and have a fantastic treat with friends! It all started when I had my friend down escaping from her university life. Everytime she comes down she is a kid in a candy store and wants to embrace the big city in a new way. We always have great adventures but this time around we were debating on what to do for breaky that morning. Randomly, I don’t remember how this came about but the idea to go for high tea came into play. We started looking up places in Toronto for high tea and holy hell some of these places were 50$ a person, uhm no thankyou! Now I am lucky. I live in the city on a main street, so basically within a 2 minute walk east or west I am surrounded by incredible bakeries and restaurants. This gave me an idea. We would create our own high tea! It was fantastic! 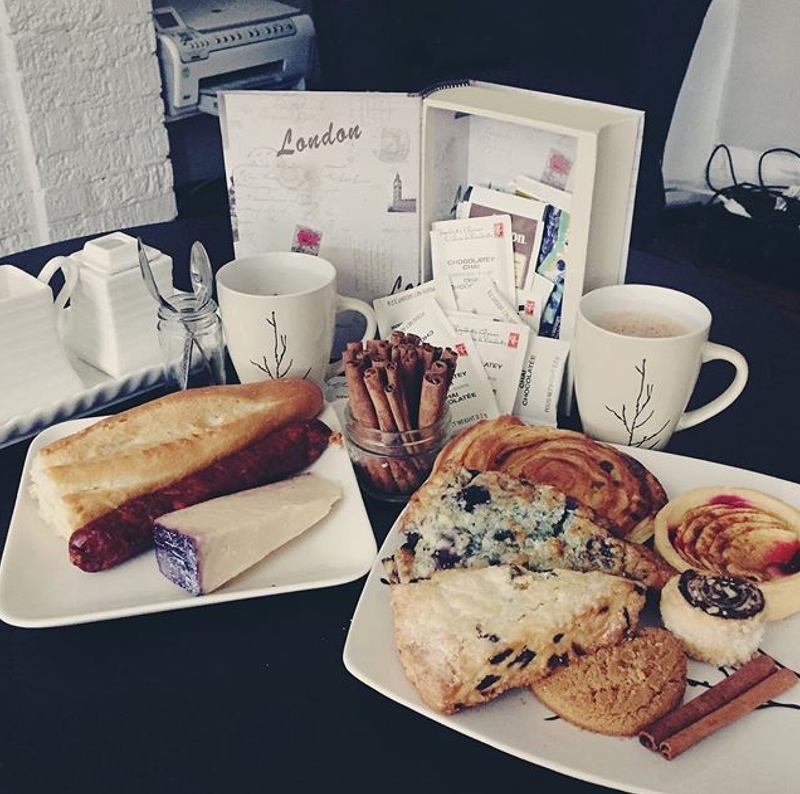 We had pastries and cheeses and croissants… And omg let me just show you! Everything here cost us under $20… Ok except the cheese but hey, we’re girls we need our cheese lol. We started the morning with a nice sunny walk down my St. Claire strip and hit up I think 5 bakeries, the butcher shop and then came home. I made coffee and tea and then I spent a good 5-10 minutes arranging everything beautifully for the perfect Instagram shot lol. But this was so delicious, obviously easy to do and did not cost a lot. We were two girls and we barely finished a third of what was here so if you had a few friends all you need to do is have everyone empty out there spare change and you could totally put together a suitable spread for you and your friends to enjoy a nice classy DIY high tea!